Sanyo have developed a new battery-assisted bicycle featuring its rechargeable battery technology “eneloop.” The new electric bicycle is the first to conform to Japan's revised road traffic laws that became effective in December and allow electric bicycles to have electric assist power twice as large as that generated by the rider. The bicycle can generate electricity while braking and running downhill thus recharging the battery while on the go. Charging while on the run decreases the number of times the battery needs to be topped off with a conventional charger. Using this technology a rider can go approximately 1.8 times further on one charge. The demand for electric bicycles in Japan has been steadily increasing over the last 10 years with over 300,000 bikes shipped in 2008. As the Japanese population is aging these figures can only increase into the future. 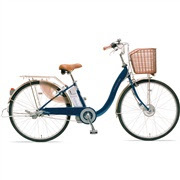 The Sanyo eneloop bicycle will be available from February 2009 and will retail at Y136 290. More information including details of the eneloop recharging system can be found (in English) on Sanyo's Homepage.